Today for lunch, Adelaide Food Central was invited to the new Revolucion Mexicana in the Central Market Arcade. As they are located so close to the wonderful produce that the markets have to offer, they use fresh and local food in their dishes. Fernando introduced us to his wonderful menu filled with beautiful Mexican food including, nachos, tacos and burritos. 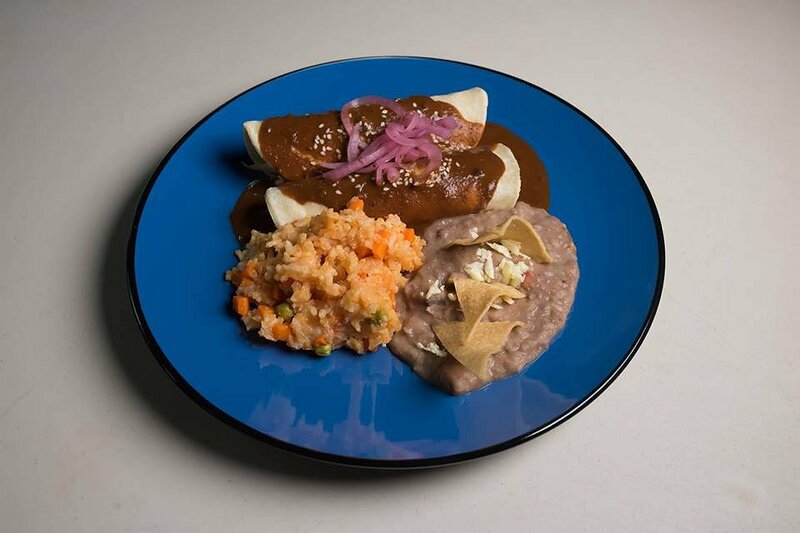 We started our feast with the Mole Enchiladas – rolled tortillas with chicken topped with mole sauce a traditional chocolate and chilli paste served with pickled onion, sesame seeds, beans and Mexican rice. The mole sauce that was used in the tortillas was rather interesting to say the least. The sauce itself had over 25 ingredients added into it, one of them being chocolate. You could taste the subtle chocolate flavour as it stood out from the rest of the ingredients in the sauce. The chicken was slightly dry but paired well with the beans and fried rice. Overall the dish was flavoursome and authentic with a hint of something slightly different; the mole sauce. 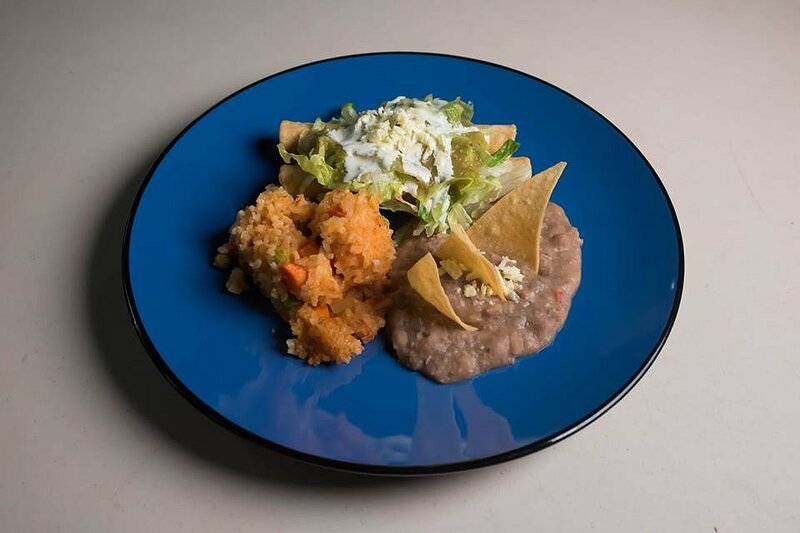 Next were the Flautas – fried rolled tortillas with chicken and vegetables, lettuce, feta cream, salsa verde, beans and Mexican rice. The tortillas were crunchy and delicious filled with creamy feta, chicken, fresh lettuce and vegetables. The tortillas and filling paired extremely well with the beans and Mexican rice. The crunchy tortillas complimented the authentic and spicy flavours of the other elements. 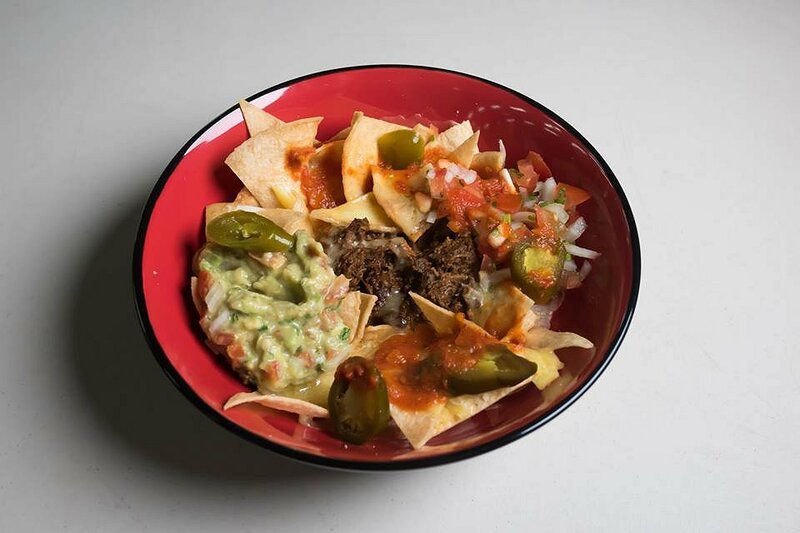 We then had their interpretation of the classic Nachos – corn chips, beans, pico de gallo cheese, guacamole, salsa with beef. This was one of the highlight dishes of the day. Revolucion Mexicana make their own corn chips, and we really enjoyed the crunchy texture of them. The beef that was used was flavoursome and succulent. The creamy guacamole, spicy jalapenos and the soft beans complimented the corn chips and the juicy beef. The cheese helped to give the dish some texture and flavour and we would have loved to see some more. 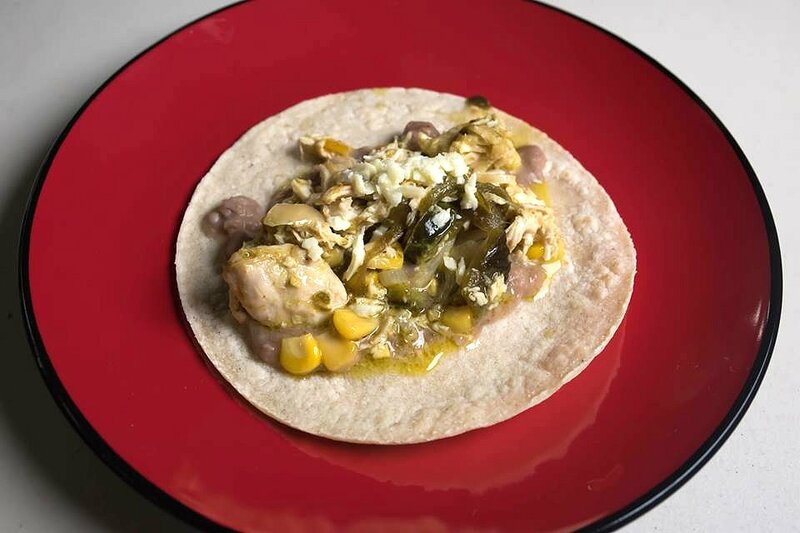 Poblano – chicken braised with herbs, onion, poblano chilli, corn, cream and cheese. This dish tasted like cream of corn soup wrapped in a soft taco. Sounds weird I know but it was absolutely delicious. I really enjoyed the creamy corn flavour paired with the tasty cheese. 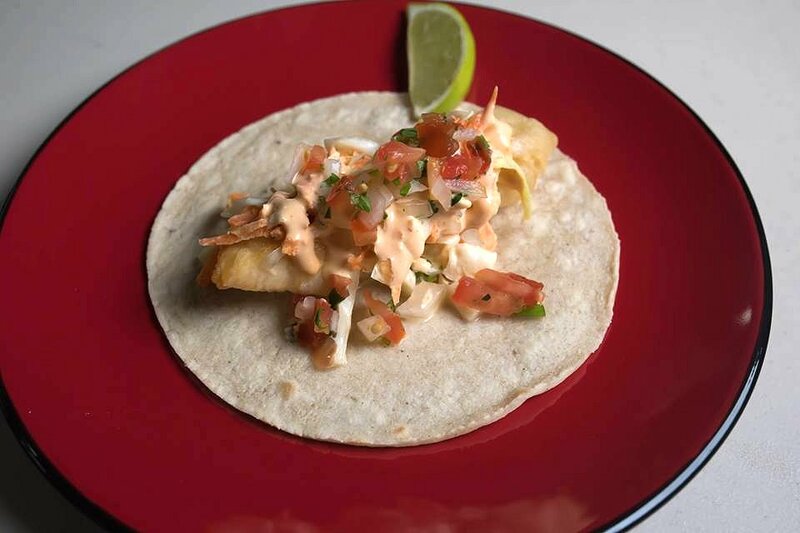 Fish – Baja market fish beer battered, zesty coleslaw, chipotle mayo. Fernando likes to mix up the fish he uses in this dish; he will choose his fish depending on what is available and fresh from the markets. The fish that was used on this occasion was the New Zealand Dory. It had been thickly beer battered and paired with a creamy and crunchy coslaw. I really enjoyed how the coleslaw complimented the delicious fish flavours. The chipotle mayo added a bit of zest to the authentic taco. Caritas – pork shoulder confit with orange, herbs and chicharron. Chicharron style pork is very popular in Latin American. They deep-fry the pork rind to add a delicious and crunchy flavour into the taco. The sweet orange pieces complimented the flavour from the pork and paired well with the fresh herbs. Paster – pork marinated with herbs, chillies and grilled with pineapple and onion. 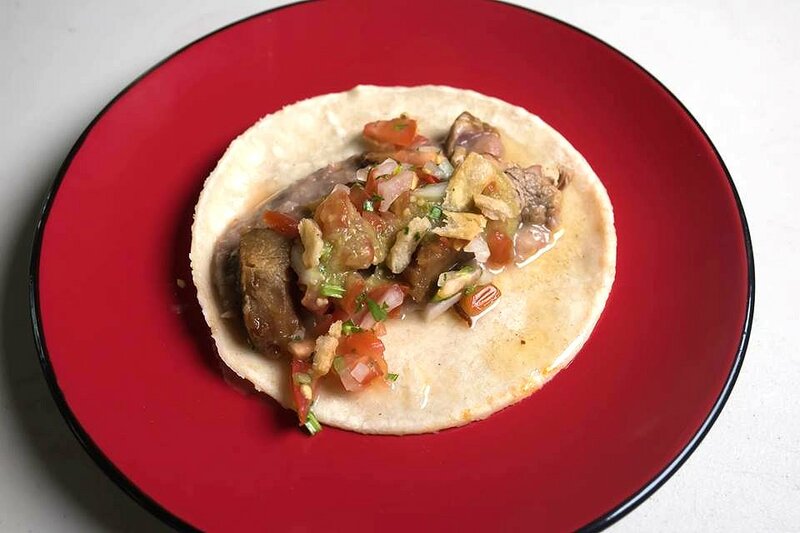 The pork used for this taco was very flavoursome and juicy. I really enjoyed the sweet pineapple flavour paired with the tender pork. The pork had been wonderfully seasoned and was very authentic. 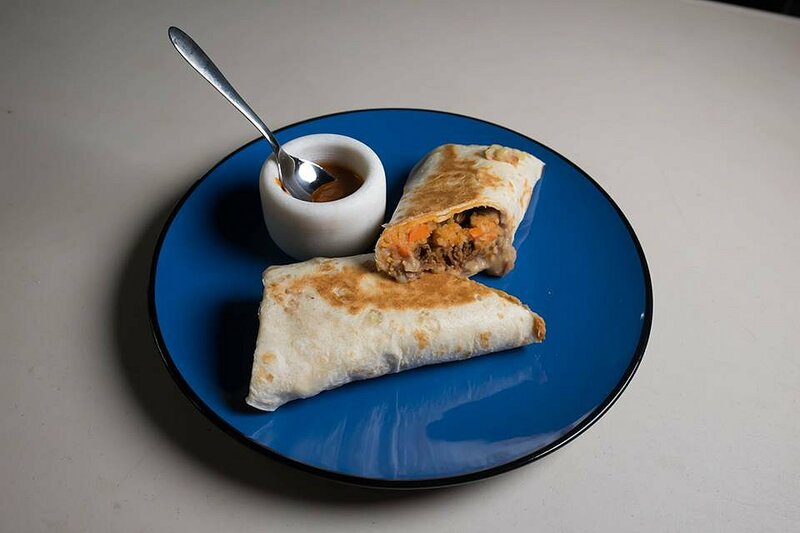 To end our meal we had the Beef Barbecoa Burrito – with Mexican rice, pinto beans, cheese and choice of sauce. When I eat Mexican my go to is the beef burrito. I was very happy with the flavours of this burrito and with the way that it was cooked. The beef was extremely juicy and had been marinated with authentic Mexican spices. 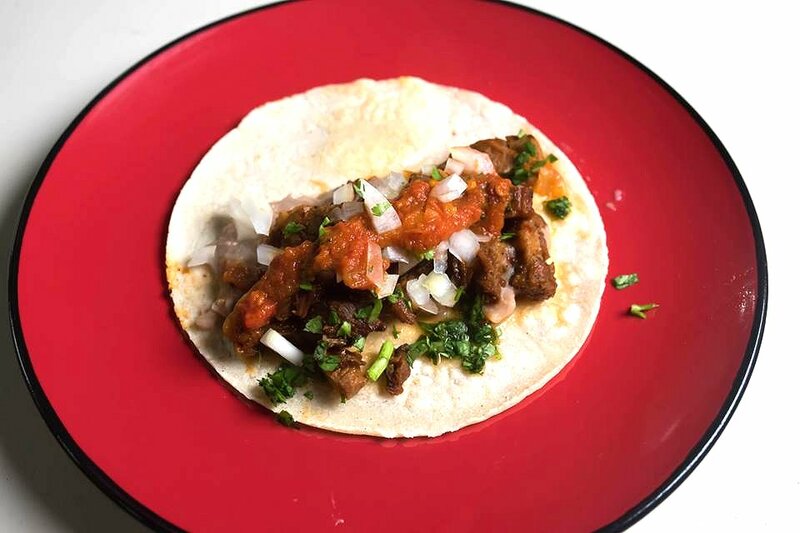 The soft tortilla was toasted perfectly, and complimented the beef, rice and beans. I really enjoyed the authentic flavours that this burrito had to offer. We would love to thank Fernando for inviting us along to sample his new menu. Revolucion Mexicana is located in the Central Market Arcade on Gouger St. It is open for breakfast 9am Tuesday to Saturday and lunch until 5.30pm Monday to Thursday and Saturday. On Fridays they are open until 9pm. If you are feeling like some spice in your life head on down to this newly opened Revolucion Mexicana.